Do I want tattoo for myself? hmnnn, no thanks but I appreciate some body tattoos. 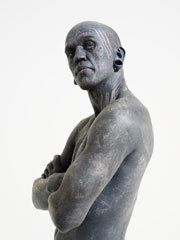 Now, check out Certified Guinness World Record's Most Tattooed Person, Lucky Diamond Rich as of 2006. 100% of his skin is totally tattooed. Cool?!!!! Yap but quite painful!